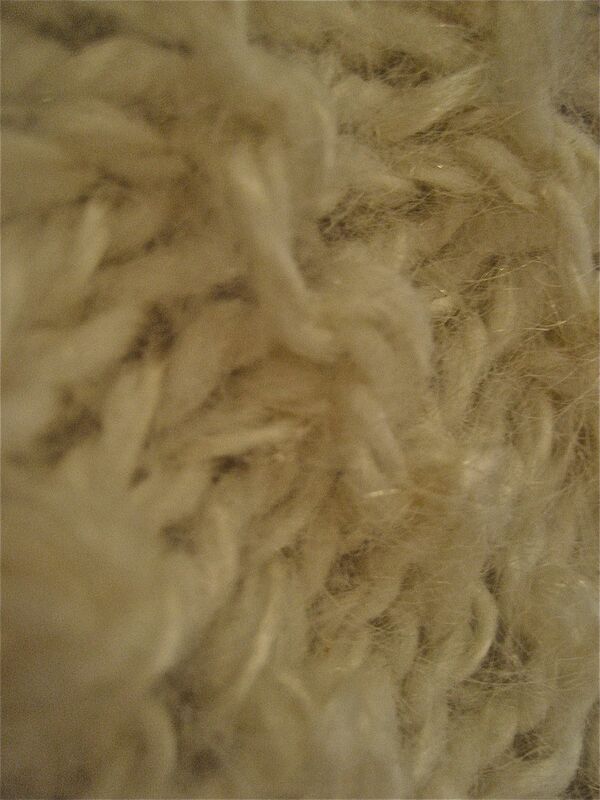 The mohair is the shiny, thicker single. The merino is the softer, fuzzier single. Ta da! The process still works! Take some beautiful, soft white wool from a merino sheep and some shiny, slick gorgeous white mohair from a goat, spin singles of each, and then ply them together for a lovely length of textured and interesting yarn. 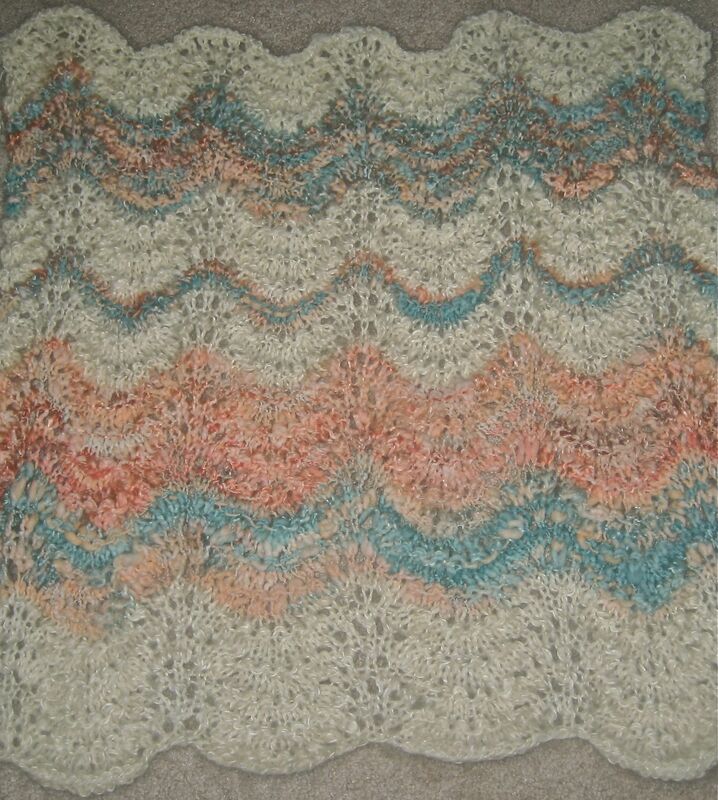 Using US 10 (or larger) needles, knit with a pattern from f.pea for a baby heirloom blanket with a lovely scalloped edge. Add some color–in this case, a skein dyed aqua and salmon from Arabella, handspun thick and thin for extra texture and interest. Keep knitting–in airports, in the car, on lovely evenings at home, to avoid housework, when you should be working, etc. 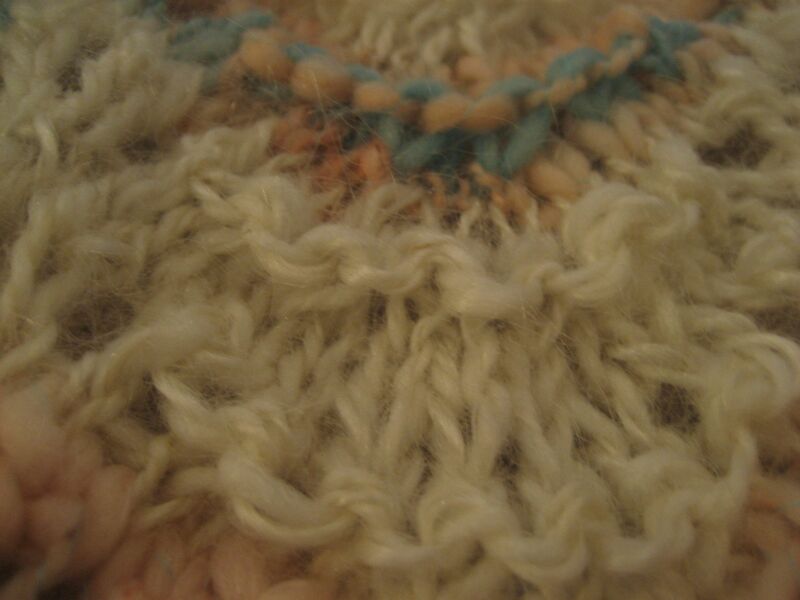 Bind off (loosely!) whenever you want to, or when you run out of handspun yarn. You have now participated in the thousands-year-old ancient collective of outfitting your family with necessary material items. Archeologists seemed surprised to find intricate beauty when they uncover textiles (or art) from thousands upon thousands of years ago. Their surprise is odd to me–because as long as we have been human, we have infused our material objects with artistic beauty and creativity. This is what it means to BE human. I like it, I like it! If you LIKE it, SHOW it! Posting a comment on a blog is a BIG commitment, in my opinion. It “puts me out there”…on the WORLD WIDE WEB, and that’s intimidating, for me and for most other people. Which is why I am so happy WordPress has added the “like” feature at the end of every post. Clicking the LIKE button is much less of a commitment than commenting, while still allowing me the opportunity to support the post and pass positive feedback to the writer. So look for the LIKE button at the end of every Spinning Universe post, and if you like the post, show it! To see the “like” button, you have to click on the Post Title and then look to the bottom left of the post. My daughter and I were in Lubbock, Texas two weeks ago, registering her for the fall semester in the basement of the college she’s attending. Hitting the PRINT button at the end of the process was the signal for completion, and success in registering. It cost 10 cents to print that final victorious document, so I put a dollar bill in the machine and quickly realized that it functioned like the old school library copiers–not giving your change right away in case you needed more copies. So I left my 90 cents loaded and told the advisor the next nine students’ copies were on me. I was so surprised by everyone’s surprise!! Their reactions clearly indicated we just don’t do enough random acts of kindness because when we stumble across one, we are so delighted. When I read this post below, I just had to pass it on to you. While I was happy to be a part of surprising a room full of people, this story below reminds us that we often don’t know and could never anticipate the giant impact of a random act of kindness on someone who has crossed our path and is in desperate need. The Spinning Universe Wants YOU! I am re-posting the message for signing up for easy email delivery of posts from The Spinning Universe. Please subscribe! Then watch your email for a “confirmation” link and click on it….that’s it! And The Spinning Universe will come to your Inbox. Beth Moore sums it up. It’s so easy to dwell on past failures I can’t change. But rebirth and new hope has come in #resurrectionsunday That’s where the peace is. #heisrisen God help me to look forward, not back! Diana Fayt Take her e-Course, The Clayer! Linda Arbuckle Learn from one of the best! Barb's Cottage Gorgeous mosaic art! f.pea Gorgeous knitting patterns, good writing! Liz Zlot Summerfield The fabulous handbuilder Liz!